Wasdale Red Pike is almost a hidden gem of Wasdale Head, sitting just slightly off to the left of Mosedale, making it less obvious in the scene than Pillar or Great Gable. As one moves into Mosedale, or heads up the valley towards Sty Head, the eastern crags of Red Pike come more clearly into view, and it provides Mosedale with a dramatic western wall. Red Pike is a fell of two very different halves. The eastern side of the fell is dominated by impressive crags that drop all the way from the summit down most of the way into Mosedale. On the western side a series of largely grassy slopes run down to Nether Beck, taking three times more distance to drop a similar distance. This area includes the large bowl that contains Low Tarn, and is bordered on the west by a set of low crags. There is only one path along the top of Red Pike, running roughly from north-west to south-east along the top of the ridge. This path connects Dore Head to the unnamed col between Red Pike and Scoat Fell. The Dore Head end can be approached by an easy walk up the valley of Over Beck or by a difficult scramble up Dorehead screes (or a very steep 'path' that runs alongside the scree run). The Scoat Fell col is normally reached either as a ridge walk, or by coming up the path past Scoat Tarn from the valley of Nether Beck. My favourite route up comes up to Black Comb at the far end of Mosedale, and takes advantage of a gap in the line of crags to easily reach the col. The southern side of the fell is fairly gentle, and the summit can easily be reached up the slopes from Low Tarn (I've come down that route). The summit of Red Pike sits right at the top of the eastern crags, with gentle slopes to the west and the cliffs to the east. Oddly the main path runs just to the west of the summit, but always ignore that! The cairn is right on the edge of the drop, so can only be approached from the west..
Red Pike can claim two tarns. Low Tarn belongs entirely to the fell, and sits and a large bowl in the fell to the south-west of the summit ridge. No major path visits this quiet tarn. Scoat Tarn is shared with Scoat Fell, and sits to the west of the summit ridge of Red Pike. A good path runs past the tarn on its way to the ridge between the two fells, so this is the more familiar of the two. Three named becks emerge from Red Pike, including two Black Becks. The first Black Beck is a short stream that emerges from Blackbeck Knotts and soon drops into Nether Beck. The second is just under a mile long, and emerges from Black Crag, one of the dramatic eastern crags. Finally Brimfull Beck emerges from Low Tarn and follows a curved course round to Over Beck. The fell is bordered by sizable streams. 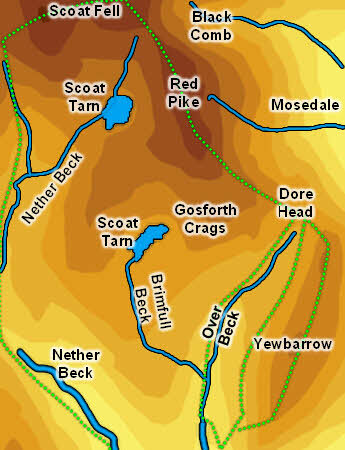 Nether Beck runs along the entire western side of the fell, all the way up to Scoat Tarn. Over Beck, in the valley between Red Pike and Yewbarrow forms the southern border. Finally Mosedale Beck borders the northern and eastern sides of the fell. Red Pike is part of the Mosedale Horseshoe, one of the classic ridge walks in the Lakes - at its full extent this runs from Yewbarrow all the way round to Kirk Fell.